The initial position for the bent press is identical to that of the side press with the possible exception of letting the weight ride more on your back than your side if your flexibility allows it. At no point should you lean back or you would injure your back! Lean slightly forward. Also note how the forearm supporting the weight, the kicked out hip, and the straight leg underneath form a solid column that supports the kettlebell. And do not forget to keep your whole body tight. Keep your lat flared. It is the hardening armpit muscle that literally elevates the weight by pushing up on the flexed triceps. The lat spread is a difficult skill to master but the side press will help. And if you are still having a hard time, pumping up the lats with a couple of sets of pull-ups, right before your bent presses, should do the trick. Lean forward and to the side in a spiral movement while keeping an eye on the bell. Imagine that you are turning away from the weight. Squeeze the bell hard, at all times. Note how the upper arm stays in constant contact with the torso, or the lat, to be exact. That is the major difference between the bent and the side presses. "The bent press is a great developer of the latissimus. A heavy bent press creates terrific pressure and contraction of the muscles on the side of the body," wrote Hoffman. 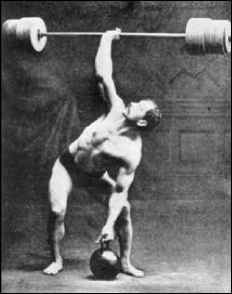 "If a bent press is held in the proper position... the weight will "rise on the latissimus" as I like to phrase it. The triceps muscle should rest crossways upon the latissimus and as the body inclines to the side and front the latissimus muscle hardens and actually elevates the heavy weight." Keep folding but keep the leg under the weight straight for as long as possible. Continue screwing your body into the ground—one of the old time names for this drill is 'the screw press'—until you are so low that your arm is straight. Do not rely too much on brute triceps power. Think of falling away from a weight that stays suspended in space. Slowly get up in the windmill fashion (4a) or in some semblance of an overhead squat. Remember to squeeze the cheeks. In the beginning you may help yourself by pushing with your free hand against your thigh(4b). Do not hesitate to push the bell away and drop it if things go sour! You should always practice the bent press and its variations outdoors, where property damage is not a concern. I insist. 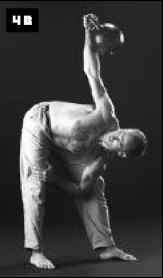 Unfortunately some comrades will never master the bent press, mostly for lack flexibility or due to bad backs or shoulders. 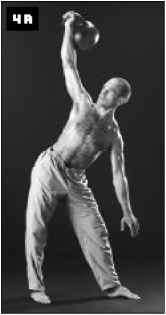 If, on the other hand, you somehow find the bent press not much of a challenge anymore, you could try the superhuman stunt by old timer Batta, who performed in France. "He was as handsome and as perfectly fashioned as a Greek statue," recalls Prof. Desbonnet. "He had very broad shoulders and his waist showed fine separation of the oblique muscles. His legs were well developed but most noticeable were his mighty arms... Doesn't he remind you of a Gladiator? His every movement is in harmony, and wait until you see what power is behind those muscles." 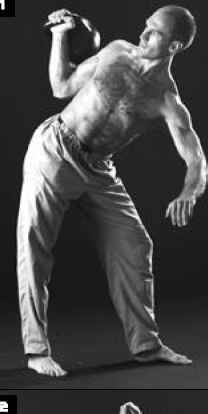 "Entirely surrounded by sharp knives," as Strength & Health magazine reported in 1938, "he would bent press 220 pounds and while in the low position place his other hand on the floor and stretch his legs out. He could maintain this position for as long as twenty seconds!" Minus the drama of knives, this 'gladiator press' will make a dandy of a drill for you. Especially if you are a grappler or just a tough guy. Another ugly evolution of the bent press is the 'two hands anyhow'. An Arthur Saxon invention that must have been inspired by too much German beer, this one is not for the faint of heart. 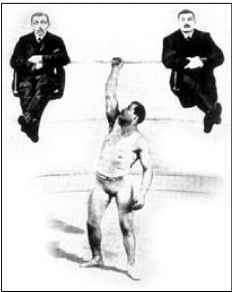 Arthur Saxon demonstrating a favorite show of strength. 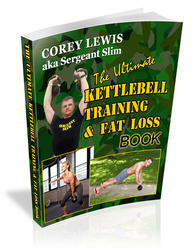 Having reached the lowest position of the bent press, curl another, lighter, kettlebell to your shoulder. Note how the elbow jams inside the knee to gain leverage. 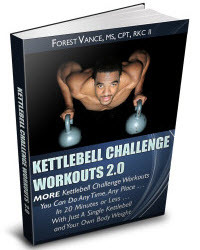 Keep your eyes on the heavier kettlebell whenever you can. Slowly stand up—always contract the glutes! —and military press the second bell. Getting out of this position with two different sized weights is a bear. Consider dropping the weights if the surface allows it, or have a comrade take one bell from you.